NEW ORLEANS, La. — The Fifth Circuit Court of Appeals in Louisiana has overturned a lower court injunction that prohibited the State of Texas from cutting Planned Parenthood from its Medicaid program, and has concluded that the district court erred in taking too lightly the inspector general’s credence in the validity of the undercover videos that were the basis for the exclusion. “[T]here is no question that the OIG (Office of Inspector General) here made factual findings after viewing the videos and related evidence,” wrote Judge Edith Jones, nominated to the bench by then-President Ronald Reagan, on behalf of the court on Thursday. “The OIG further concluded, based on the videos, that the provider plaintiffs at a minimum violated federal standards regarding fetal tissue research and standards of medical ethics by allowing doctors to alter abortion procedures to retrieve tissue for research purposes or allowing the researchers themselves to perform the procedures,” she wrote. As previously reported, following the review of two lawsuits surrounding alleged unlawful Medicaid billing practices, as well as an undercover video released in 2015 by David Daleiden and the Center for Medical Progress, the Texas Health and Human Services Commission (HHSC) sent a letter to Planned Parenthood Gulf Coast, providing the entity with a notice of termination from its Medicaid program. “The [undercover] videos [also] indicate that you follow a policy of agreeing to procure fetal tissue even if it means altering the timing or method of an abortion. These practices violate accepted medical standards, as reflected in federal law, and are Medicaid program violations that justify termination,” it outlined. 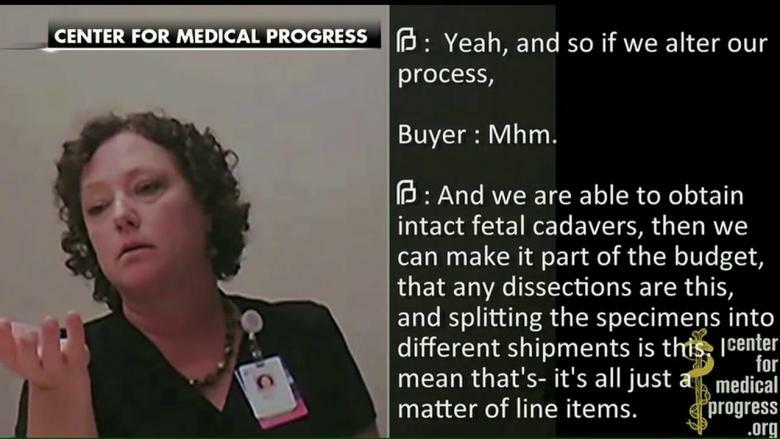 The Center for Medical Progress had captured Melissa Farrell, director of research for Planned Parenthood Gulf Coast, discussing with undercover investigators the “diversification of the revenue stream” over dinner, along with a visit to the organization’s pathology lab, where workers sorted through the remains of aborted babies. Planned Parenthood sued the Texas HHSC in November 2015 in an effort to retain its participation in the Medicaid program, asserting that the termination was illegal, but the Commission did not yet cancel the contract as originally planned. The following year, the State moved forward, issuing a final notice that Planned Parenthood would be defunded in 30 days, resulting in the organization again filing for an injunction. In February 2017, Judge Sam Sparks, nominated to the bench by President George H.W. Bush, ruled in favor of Planned Parenthood, opining that Texas was without justification to cut the abortion giant from the state’s Medicaid program. “A secretly recorded video, fake names, a grand jury indictment, congressional investigations—these are the building blocks of a best-selling novel rather than a case concerning the interplay of federal and state authority through the Medicaid program,” Sparks remarked. However, on Thursday, the Fifth Circuit Court of Appeals vacated Sparks’ injunction, ruling that he too quickly brushed off the inspector general’s decision, which was based on the undercover videos. “In sum, the district court erred by giving no deference to OIG’s factual findings and by accepting evidence beyond the agency record,” Jones wrote. “It is even odder to claim that federal judges, who have no experience in the regulations and ethics applicable to Medicaid or medical practice, much less in regard to harvesting fetal organs for research, should claim superior expertise,” she declared. The appeals court sent the ruling back to Sparks to re-review the request for an injunction under the proper standard. View the decision in full here.